Stuhrling Original Watches are back following a complete revival! This time, they embraced many a significant improvement, starting from the movements to their designs and build quality, leveraging the brand significantly. The Stuhrling Original Watches shine with their solidity, even those with a bare-all look. 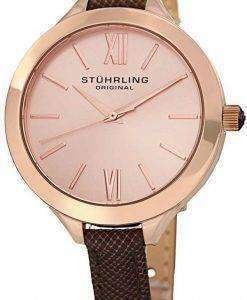 Both Stuhrling Original Men’s and Stuhrling Women’s Watches are incredible timepieces. That mark their excellence not through marketing gimmicks but with their durability, precision and performance; especially for the Stuhrling Original Automatic Watch collection. Their Swiss origin aside, Stuhrling Original Watches merge together class and prestige with marks of a sophisticated intelligence. Which brings forth artful representations combining different time periods through influences like geometric designs and vintage, round case-shapes. At their very core, they come without the pretence of ceremonial foolery. Whether it’s a piece – irrespective of quartz or automatic – meant for the casual wearer or the die-hard veterans.